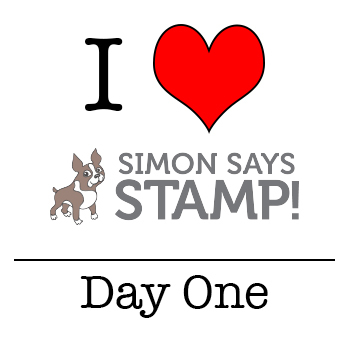 This week it’s all about Simon Says Stamp. Not only is it the best one stop shop for crafting supplies, but I love that they have their own line of exclusive products. 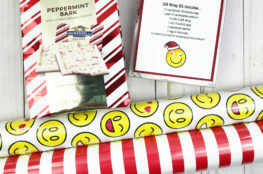 Their products always bring a smile to my face and I like that there is always a good variety of design- something for everyone’s style. Oh and anything with Kristina Werner’s handwriting is amazing, right!? Heidi Crowl (the owner of Simon Says Stamp) is one of the hardest working, genuine, kindest people I’ve ever met. I adore her and so blessed to call her a friend. 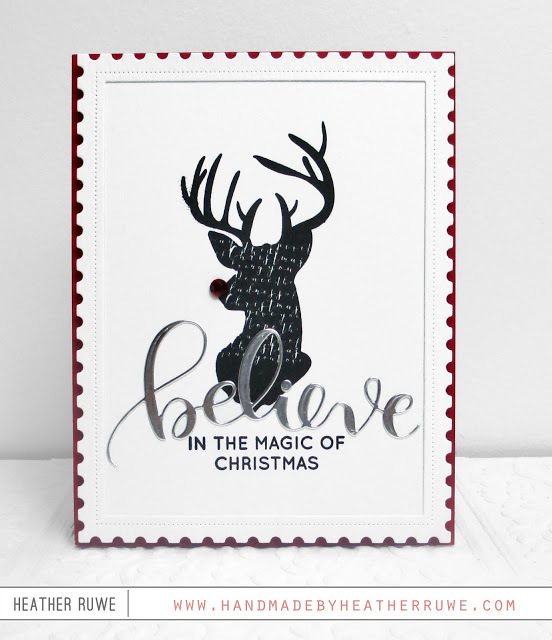 You can find more about Simon Says Stamp’s story HERE. …so I thought it would be fun to share a week of inspiration using the products from this release. One of my favorite stamp sets in the release is THIS stamp set. (I will be sharing more projects with it later this week.) 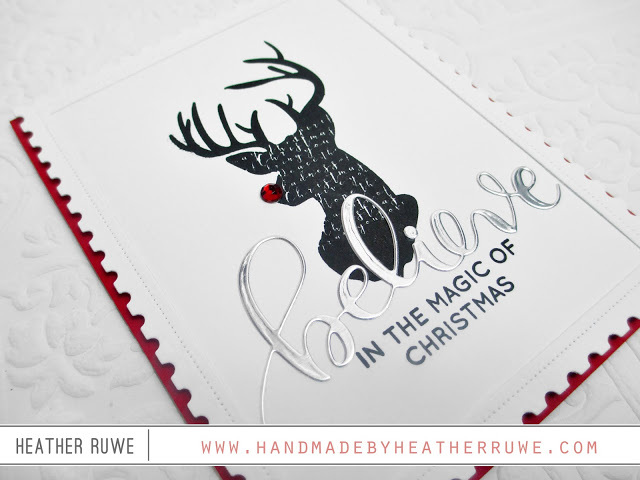 I stamped the deer image in black on to some white cardstock and then added a red gem to make him look like Rudolph. I also added THIS die-cut word using THIS foiled cardstock and stamped a coordinating sentiment from THIS set. 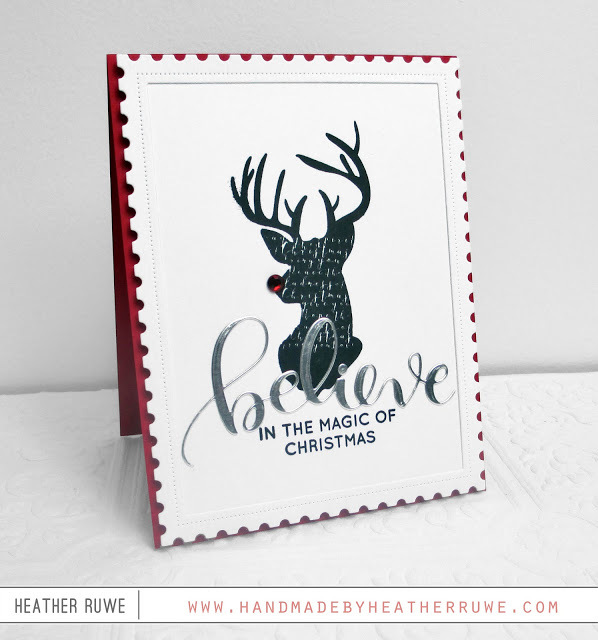 I framed out the scene using THIS die and mounted it to a red note card created from THIS cardstock. That’s it for today. Thank you so much for joining me and I’ll be back tomorrow with Day Two’s project. 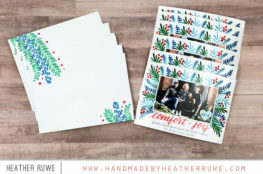 Not the traditional Christmas card but I love your techniques! Thanks for sharing!